Ontario Government and Metrolinx are partnering with Woodbine Entertainment to build a GO station in Etobicoke North at Highway 27-Woodbine. Jeff Yurek, Minister of Transportation, along with Kinga Surma, MPP for Etobicoke Centre and Parliamentary Assistant to the Minister of Transportation, and Phil Verster, President and CEO of Metrolinx, announced the Ontario Government’s plan to build a new GO station at Woodbine Racetrack at no cost to taxpayers. The Ontario Government and Metrolinx are partnering with Woodbine Entertainment to build the station along Highway 27, on the Kitchener GO rail line. The new station will be located at the south east corner of the property. As part of Ontario’s broader strategy to deliver more transit solutions in the GTHA, the province is pursuing a transit-oriented development approach to the delivery of transit infrastructure to reduce the cost to taxpayers. Woodbine Entertainment has development plans that will bring new jobs, housing and entertainment opportunities to the area around the station. Now that the train station project is approved, when will construction start? The construction start date is still to be determined. The first step is to develop a construction plan that will ensure the safety of the horses and the people working in the backstretch. When will the train station be complete? It will take a few years to complete this project and it’s too early set a completion date. Once the construction has started, how will the noise be managed? The safety of the horses and the people working on the backstretch is extremely important to us. We will work closely with our partners to develop a plan that manages noise and protects the horses during the construction phase, much like we are doing now with the construction that is near the main track. Once we have a more detailed answer, we will share it with you. What about noises from the train station itself once its complete? The safety of the horses and the people working on the backstretch is extremely important to us. The train track that will serve this new train station is already fully operational and has not caused any issues in the past. That said, we will work closely with our partners to develop a plan that manages noise and protects the horses during the construction phase and for when the train station is complete and fully operational. We will keep you posted as this situation evolves. Will the training track be moved? There are currently no plans to move or change our world-class training track. It will continue to be fully operational during the construction and once the train station is complete. The training track will be a few hundred metres away from the train station itself. 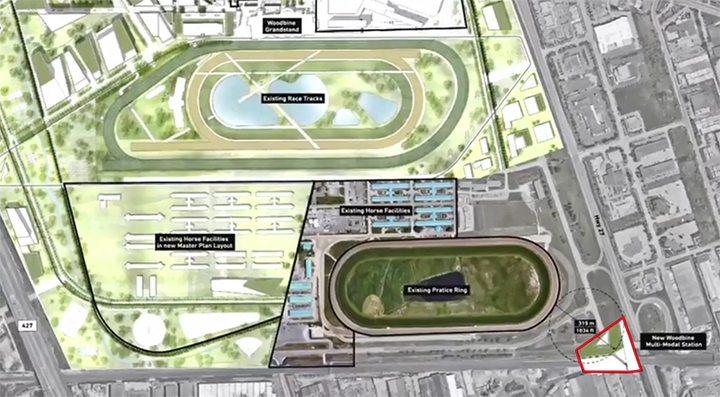 Will the backstretch barns and other buildings, like the dorms and sales pavilion be moved? There currently are no plans to move the backstretch or eliminate any of the facilities or amenities. The Woodbine Districts master plan was created with horse racing always being considered the most important use on the site and the centre of all future plans and this remains our focus. Everything we are doing to develop our lands is to create sustainability for our number one priority – horse racing. During construction, how will I access the training track and barns? As of right now, there are no indications that access to the various backstretch areas will be impacted. Why is Woodbine paying for this project instead of putting the money right into purses and horse racing infrastructure? The best way to grow and sustain the horse racing industry is by developing our land to provide new sustainable revenues for Woodbine. This will provide long-term stability for the industry. As it relates to this specific project, provincial funding will not be used to build the train station. However, Woodbine Entertainment is actively identifying partners to provide capital while we provide the land. Building a train station is a huge part of unlocking the value of Woodbine Entertainment’s land. It is important for Woodbine and the future of horse racing that we become self-sustaining and not reliant upon government handouts. Being able to tap into resources from the private sector to move the development project forward will allow us to realize the significant value of our land and benefit the entire horse racing industry. This is the most exciting development project in Canada and has immense potential to grow and sustain horse racing for decades to come. The location of the train station will be pretty far from the grandstands. Are there any plans to run shuttles from the station to the grandstand? Now that the project has been officially approved, these are the types of questions we are exploring to determine what’s best for everyone, but there is an intention to provide a convenient way to connect visitors from the station to the grandstand and vice versa. The operation of the GO Station will be exclusively managed by Metrolinx. They will determine the schedule, hours of operation and frequency.